What is DealGuardian? It's a new sales platform for the internet marketing industry. The new kid on the block is set to be a competitor to several popular platforms like ClickBank, the Warrior Special Offers (WSO) section from the Warrior Forum, and marketplaces like AppSumo, CodeCanyon and the like. Taking inspiration from newer and innovative ecosystems like Apple's iTunes or Amazon's Kindle, DealGuardian tries to combine the advantages of the older systems, while eliminating some of their shortcomings – like high refund rates, locked PayPal accounts, or manipulated bogus reviews. DealGuardian will open later today for sellers of internet marketing products to sign up and add their products. At first look, it’s an exciting and promising concept. I'll share a more detailled DealGuardian review once I've signed up and found out more details. Check out the video below, where Mike Filsaime explains DealGuardian and how it plans to leave ‘outdated’ competitors in the dust. Update: The DealGuardian website is getting more and more complete. 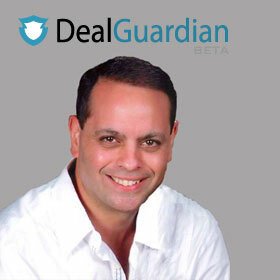 A few days after publication of this post they have added an extensive About DealGuardian page. Lots of good information.